Travels | Do you remember Olive Morris? 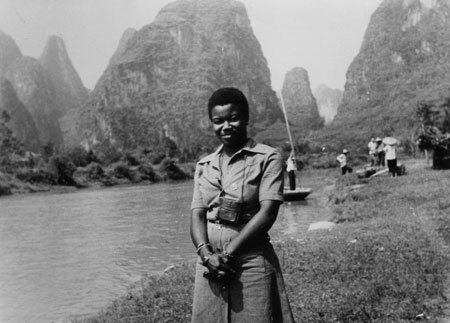 Olive Morris was both an avid traveler and an internationalist. Towards the end of her life she was to visit China with a delegation of British people, possibly Marxists with whom she had made contact during her University years in Manchester. These photographs of the trip to China show a more mature Olive, with the same confidence of her younger years but perhaps a little less fury. It pains to see her relaxed and happy face in this picture by the water, and to think that someone who looks so at ease in the world was to die so soon. 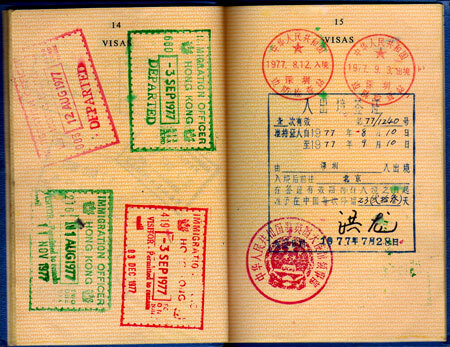 The stamps on her passport indicate that she traveled via Hong Kong, arriving there on August 11 1977 and departing for mainland on August 12 1977. On September 3 1977 she returns to the UK again via Hong Kong. If you have any information about this trip, or were in the same party, please use the comments box below to share your memories. In 1972, Olive Morris advertised in Time Out for a travel companion to Algeria, where she hoped to visit the American Black Panther Eldridge Cleaver, who was at the time living there in exile. When no one replied to her add, Liz offered to join her. Olive had some money saved towards the journey and Liz contributed her extensive hitch hiking experience. They left Dover on August 7 1972, and traveled in the ferry overnight, entering Calais on August 8 1972. From there, they hitch hiked through France and Spain. Liz recalls that in France they faced a lot of hostility, but people in Spain didn’t seem to take any special notice at the sight of two young Black female hitch hikers. On August 17 they took a ferry to Morocco at the southern Spanish port of Algeciras, entering Tangiers on the same day. 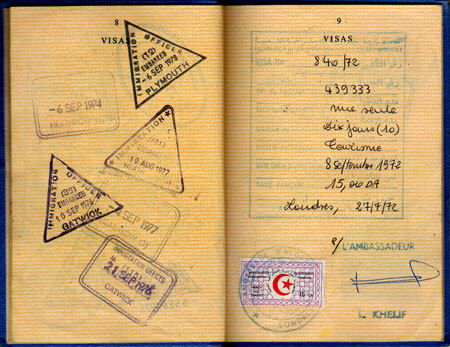 Their intention had been to continue traveling and to enter Algeria from Morocco, and Olive’s passport testifies to this showing visa stamps for both Morocco and Algeria. However, and as Liz recalls, they run out of money and had to stay put in Tangiers waiting for their families to send money for their return fares. When Liz told me this part of the story she laughed. She said: “Imagine the two of us, young radical revolutionaries, showing up everyday at the British Embassy to get some cash for expenses, and getting our passports stamped with the amount we received”. During the days they stayed in Tangiers, Olive befriended a white male gay couple from Britain, and they used to meet with them for breakfast. 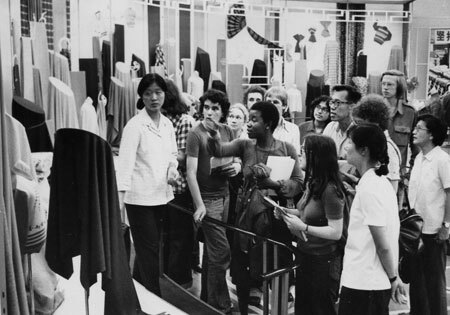 Liz remembers this as an example of Olive’s amazing capacity to cross over and to make connections with people of all kind of backgrounds. Eventually the money from home arrived. Liz mother had sent money for a flight, and Olive’s mum sent money for a train ticket. As by then Olive was rather pissed off with their failed trip, Liz offered to swap tickets. Liz then returned to London by train, whilst Olive took the flight arriving in London on September 5 1972. They didn’t have a camera at the time, and so there are no pictures of the journey. 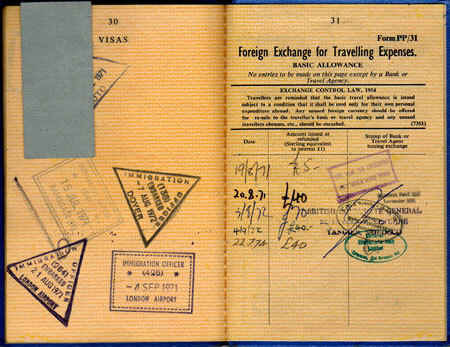 Liz and Olive took turns to write a travel diary, that is now part of Liz collection.